Winter’s end, it’s hard to believe it may finally be here. 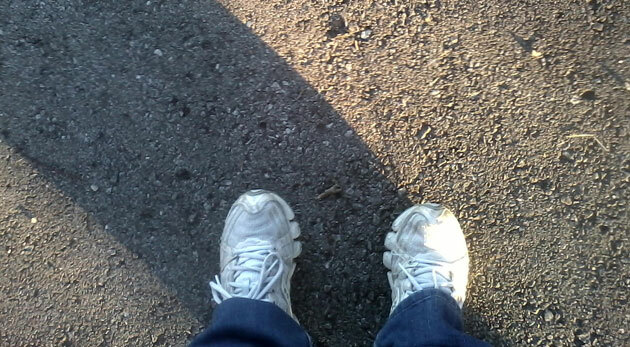 The temperature has warmed up enough here in the Midwest to get out and go walking, yay!!! Happy dance….er, happy walk! Everyone wanted to enjoy the nice weather, so the kiddos and I headed up to the park. The kiddos, including R1 who was home on spring break, hit the basketball court and I hit the walking trail. 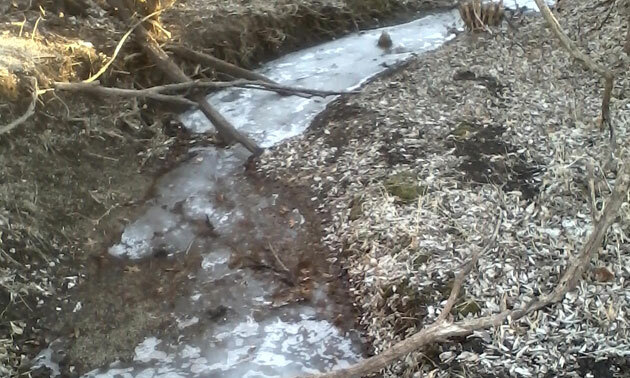 Even though it was warm enough to feel like winter’s end, there was still ice lingering in the creek in the park. This is such a great park. Not only does it have all the ball fields where the kiddos umpire in the summer, a basket ball court, and a walking trail circling the soccer fields- it also has a trail that leads through a ribbon of woods over a creek and into a large meadow. The city keeps a walking path mowed around the outside of the meadow, but the center stays wild and natural. It’s easy to forget you are in the city for at least a bit while walking this little path. 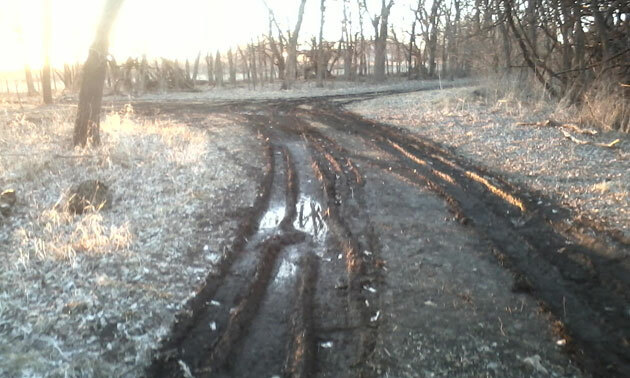 Is it immature of me to admit that I actually enjoyed smushing along the muddy path through this part of the woods? 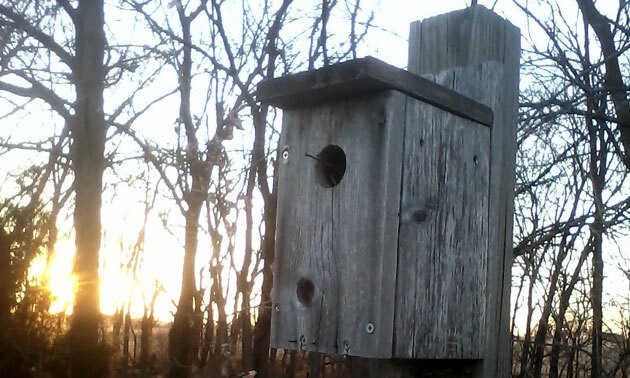 I love how they have boxes like this one set up all around the meadow, just waiting for winter’s end and for the new tenants to move in. I couldn’t resist journaling the day in my Midori Traveler’s Notebook. 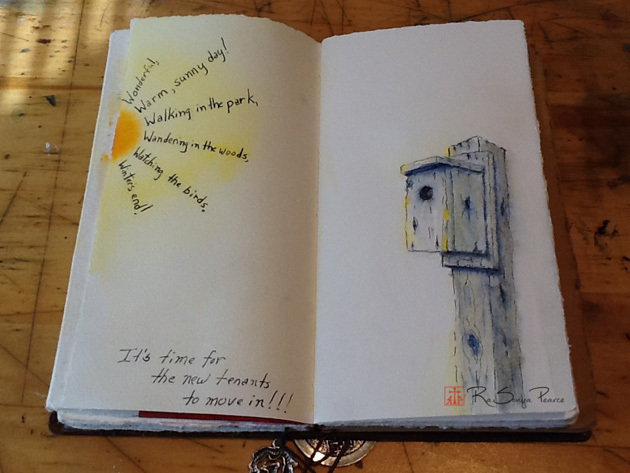 Great sketch of the birdhouse and sun beams! Theme ties together well. I’m with you on walking through mucky stuff. I’m in Little Rock on business. Rained most of the drive here and I loved it! 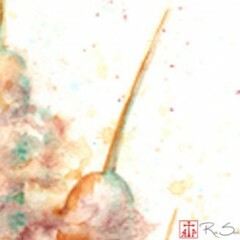 It cleaned the air and is an indicator of the coming Spring. When I filled with gas I just walked out in it for a while. John- Thank you! It’s nice to know I’m not the only person who enjoys splashing about in the rain. There is nothing like seeing the world washed clean, and that after the rain smell, hmmmmm!!!! !